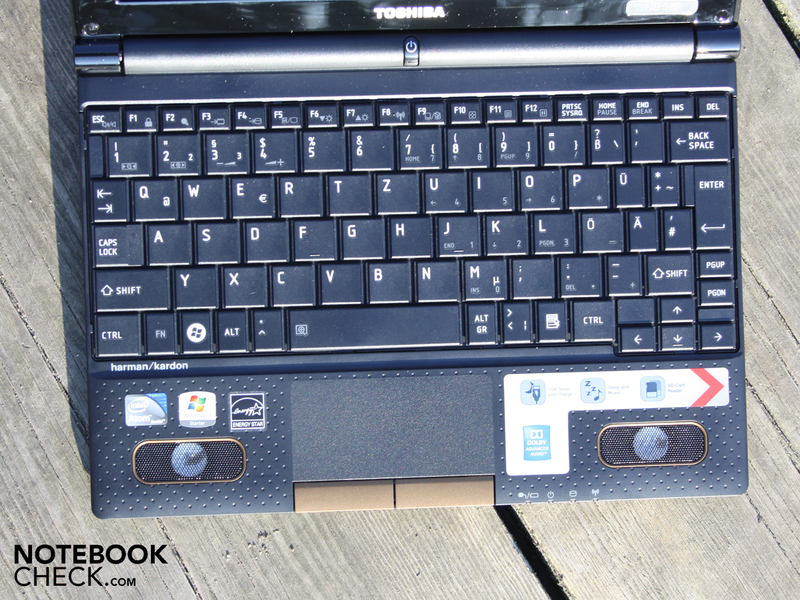 Toshiba NB520-108 brown: Dual-core netbook with subwoofer acoustics. The media market calls it a mobile sound miracle. We call it the unusual attempt to equip a 10-incher with a subwoofer and 2 x 2 watt Harman/Kardon speakers. Find out in our section on sound whether the mobile DJ can really fill the open wagon of an ICE with it. 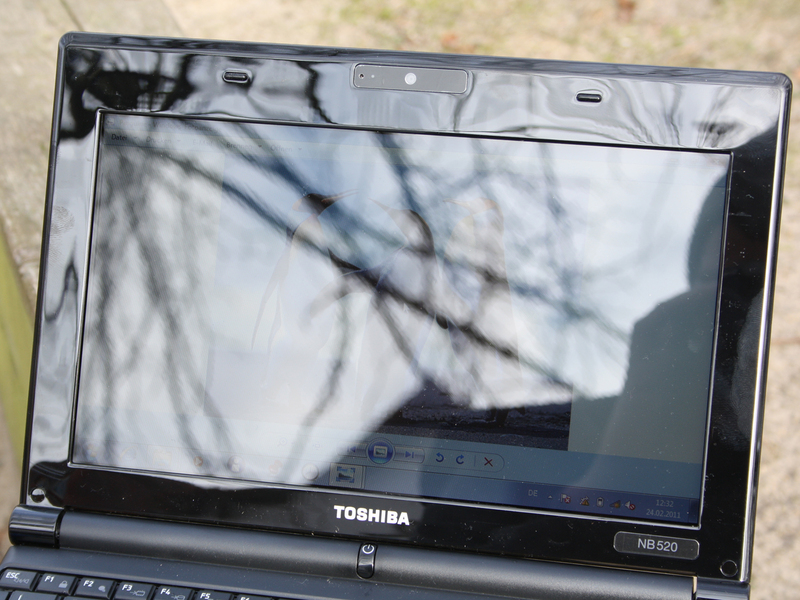 We recently had the sister model Toshiba NB550D-10H under the microscope in a comprehensive review. 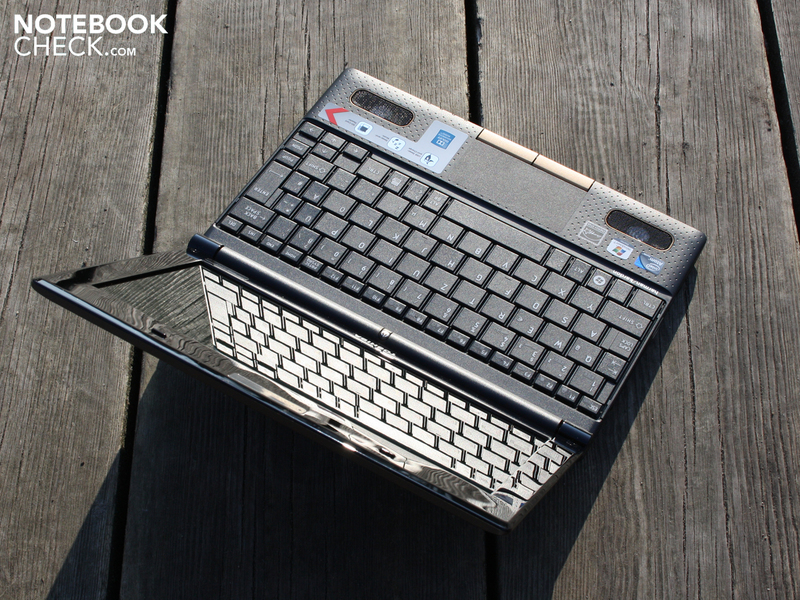 It was the first netbook we had in our hands with the new AMD C-50 APU including a Radeon HD 6250 graphics unit. Fusion showed itself to be an exciting alternative to the current Atom N550 systems. The reason: Fluid HD-playback through a UVD 3 video decoder and high-resolution image output with HDMI. 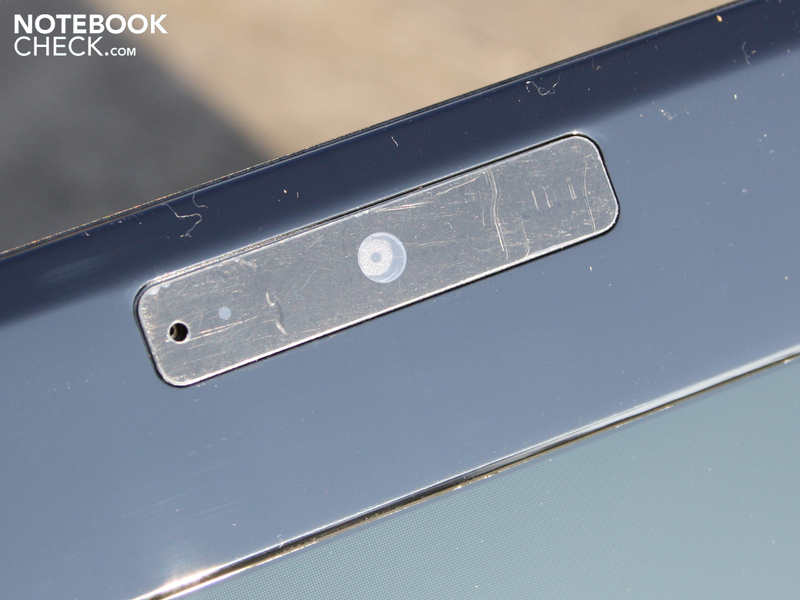 It's exactly this HD-capability which is missing on the NB520-108 before us. The Atom N550 dual-core only has a GMA 3150 without a suitable video decoder at its disposal. In the previously reviewed single-core Atom testers that wasn't enough for H.264 coded HD-videos over 720p (and Flash HD videos such as those on YouTube). 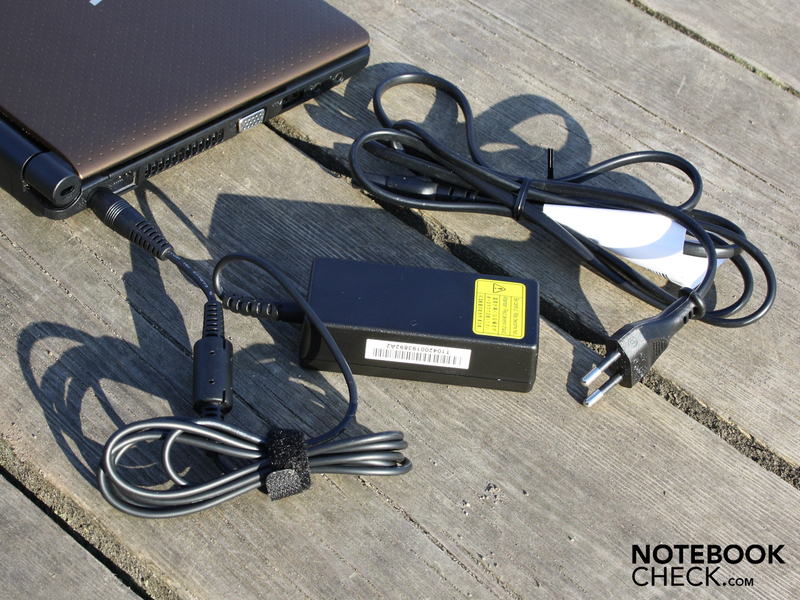 Find out in this review whether or not the dual-core N550 rectifies that. 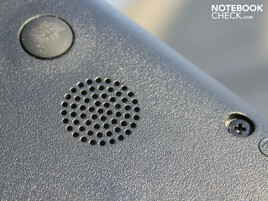 The relatively large speakers are found directly in the palm rest. 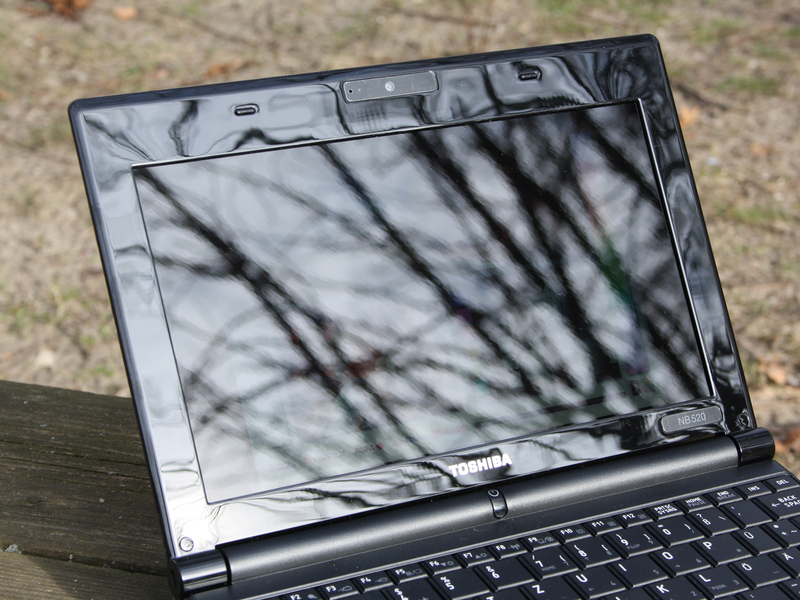 Toshiba enters the new netbook-year with a fresh look. 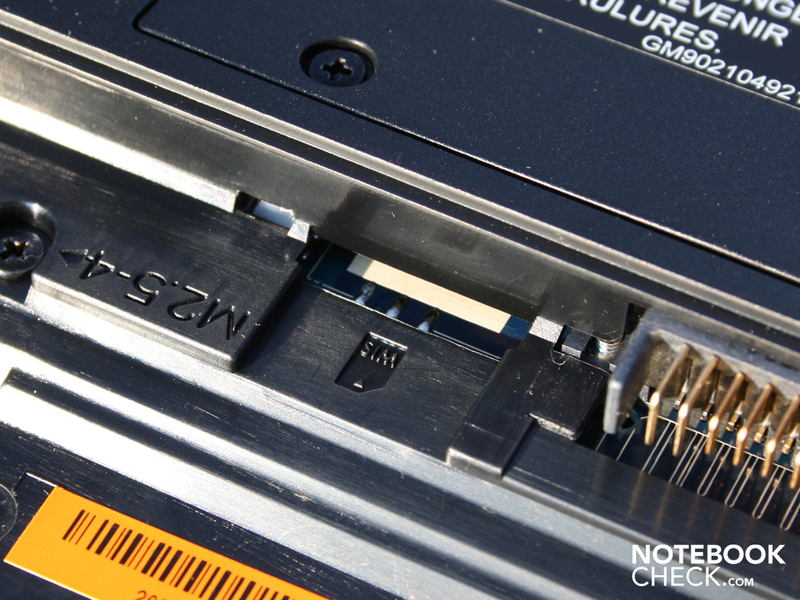 The black plastic case on the old NB500 was complimented with brash, yet matte pastel colors. The border of the speakers, the mouse keys and last but not least, the coloring of the lid ensure for a colorful appearance. Our brown-metallic tester seems subdued and doesn't appear too gaudy. The stable construction with the tautly secured hinges and the firm base plate give it a valuable feel. The keyboard surface sits securely across the board. We no longer found the slack in the middle which we determined on its sister model NB550D. The rubber surface of the display lid can be ordered in brown-metallic (like our tester), lime-green metallic or orange metallic. The pattern as well as the blunt surfaces ensure for excellent grip. 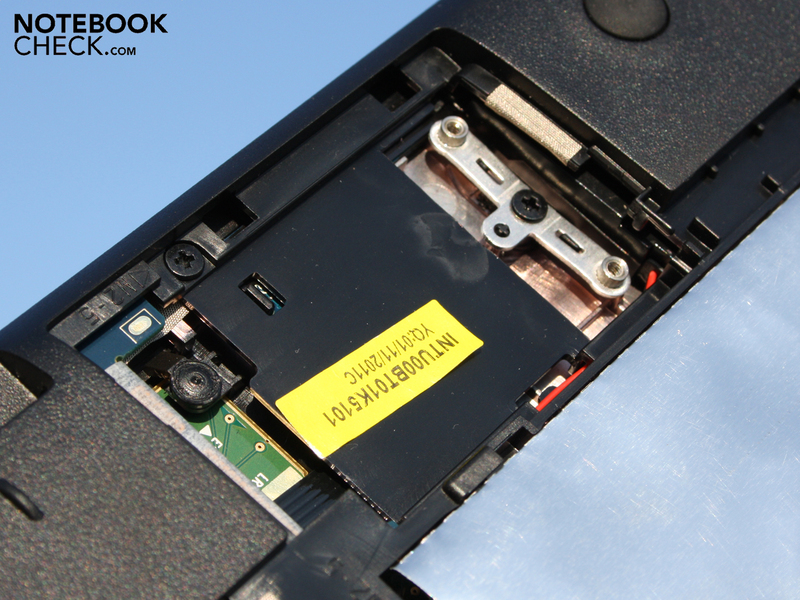 Fingerprints only have a chance on the NB520 in the glossy display frame. The lid's surface as well as its corners are relatively stiff and can hardly be dented or warped. 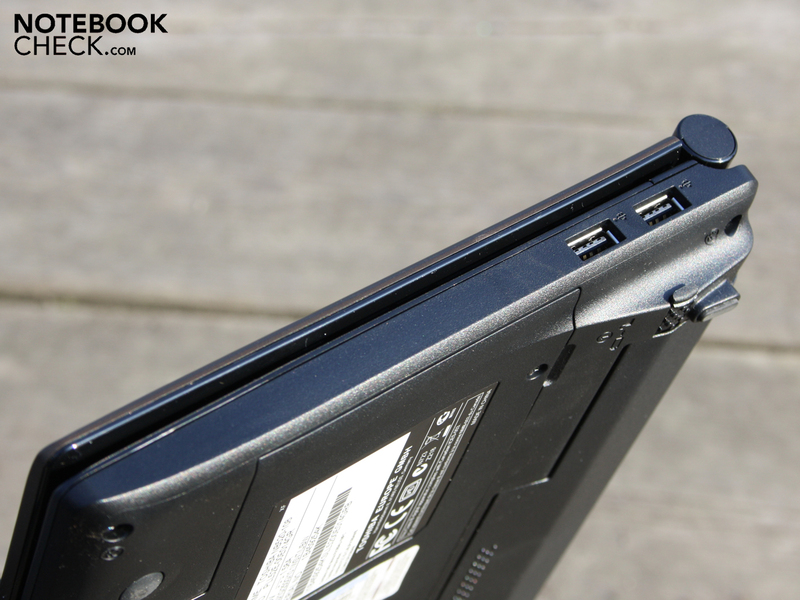 Its weight of 1.28 kilograms including the 6-cell battery is within reason for a netbook with a 10" display. 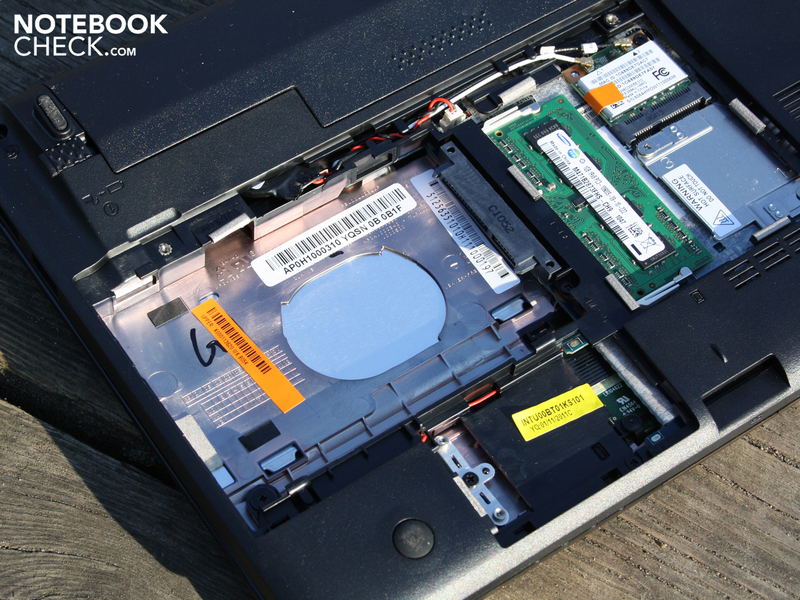 There is a service flap on the underside for changing out the memory or harddrive. The WLAN module can also be replaced. An unoccupied screw connection for a half-size mini PCI card can be seen under the panel, but this can't be occupied separately with a component. It's simply missing the brazed-in plug. 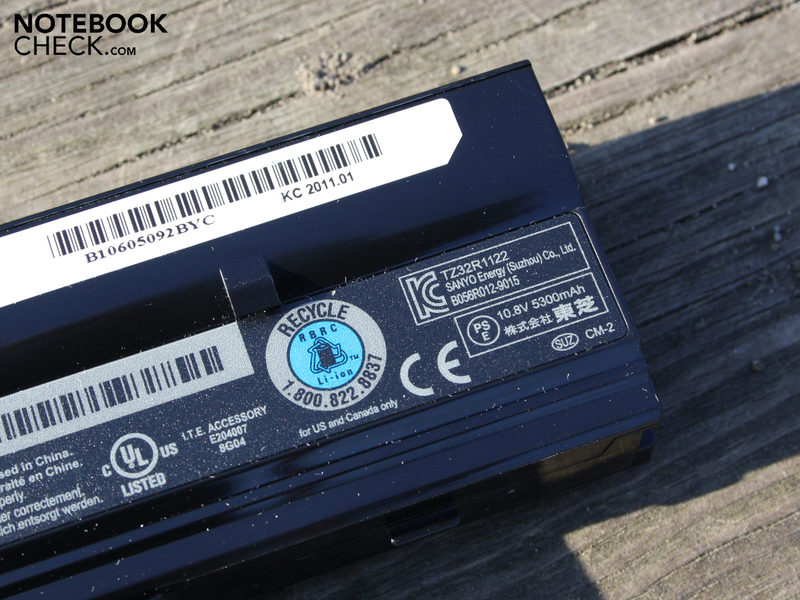 We think the netbook is equipped with this empty space as it is potentially intended for a UMTS version (SD-Card slot under the battery). 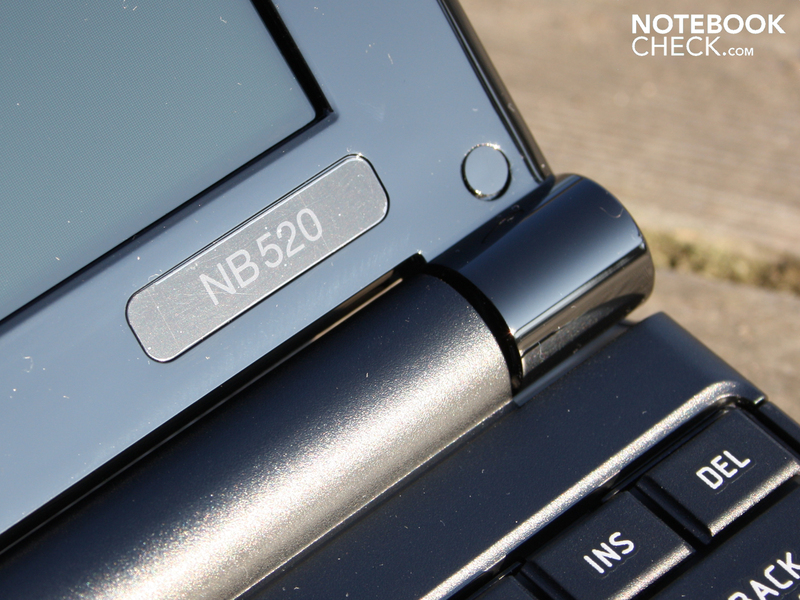 The NB520 displays the kind of simplicity typical of a netbook. 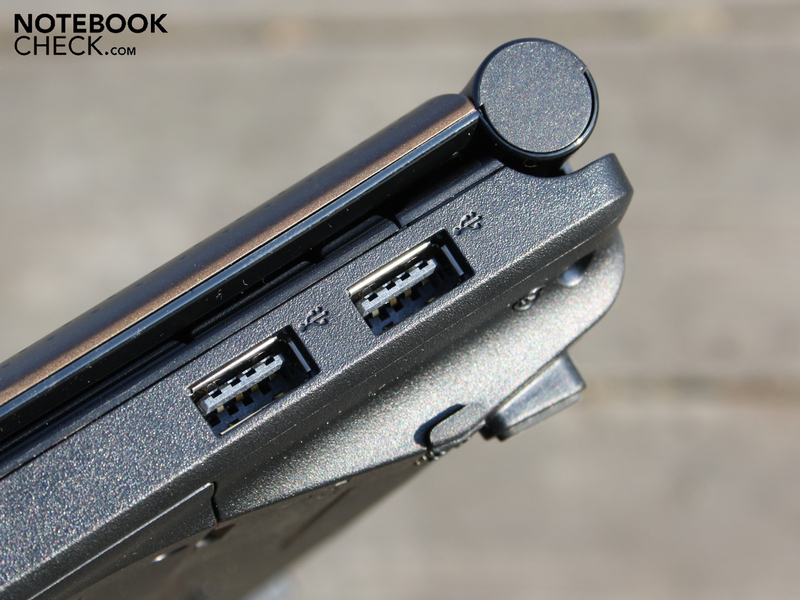 The visible connections include three USB 2.0 ports, a CardReader on the front (only SD), the VGA plug (D-Sub), the RJ45 network connector and two jack-plugs for a headset and microphone. 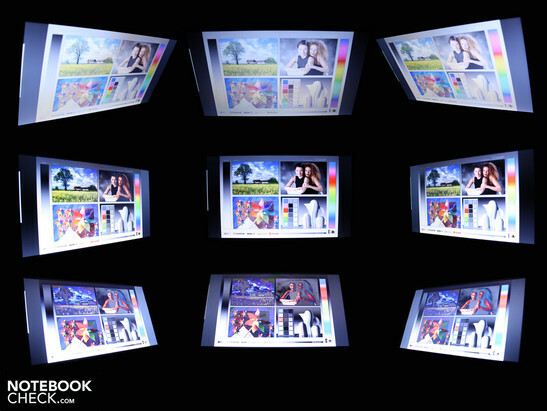 The inconspicuous webcam in the display frame can only take photos in VGA, or in other words 640 x 480 pixels (0.3 MP). Yet the resolution is not the only thing that's limited, rather the quality is as well. The poorly lit webcam delivers a grainy picture. In addition to WLAN-Draft-N (Atheros AR9002WB-1NG), the case also houses Bluetooth and a Fast Ethernet Controller (no Gigabit LAN). The Bluetooth module only supports 2.1+EDR, but one should be able to download a software upgrade to Bluetooh 3.0 (Toshiba support website). This allows the additional high-speed channel of the module which is already in place to be used (up to 24 Mbit/s). Out tester doesn't have an integrated 3G-module. But the available SIM-card slot (below the battery) and the place-holder for a corresponding UMTS/HSDPA modem give us hope that a 3G version is upcoming. 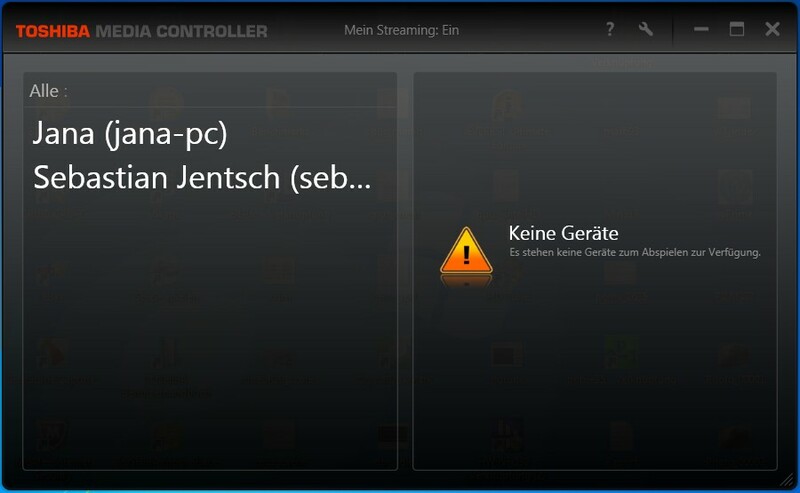 The manufacturer went the usual route in terms of software and included neither a driver- nor a recovery-DVD. The latter can be burned by the buyer with an external burner via Recovery Media Creator. As usual, the operating system in its ex-make state is on a Recovery partition of the harddrive. A range of so-called Usability Tools should make life with the 10-incher easier. This host of tools seems excessive and the user has the agony of choice when deciding what they should or shouldn't delete. Toshiba throws in a Media Controller, Eco energy-savings function, USB Sleep-and-Charge, Smart Display and TEMPRO Performance Tuning. A Nero-package couples backup-tools, burner, data recovery and Media Hub (media reproduction). 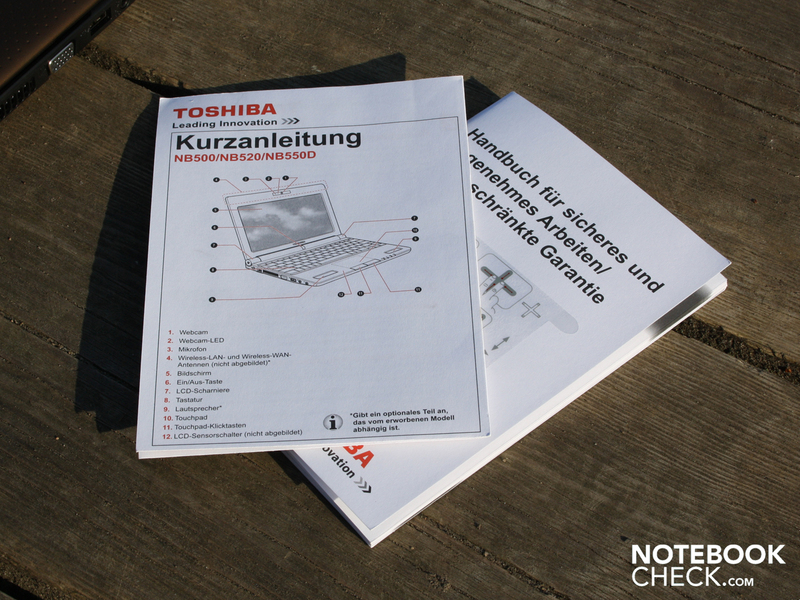 Toshiba imparts a 2 year international bring-in guarantee including an on-site collection service in Germany and Austria. The condition for this is that one registers the repair on the Toshiba notebook hotline. The keys have a medium hub, a clear pressure point and a solid stroke. The entire surface of the inputs is taught. The keys aren't spaced far apart from one another, but generally have a dimension like those on a 15.6-incher. To make up for that, the size of the 'umlauts' and Shift/Enter keys was reduced. The keys also expand to the furthest edge of the chassis. A plus: The direction keys are offset a bit towards the palm rests making it easier to make blind inputs. The multi-touch pad from Synaptics (V7.2) offers many settings for personalization. Those for instance who don't want multi-touch can simply turn it off. Those who can't get enough of multi-finger can deactivate the vertical and horizontal scrollbar, thereby enlarging the real usable surface. 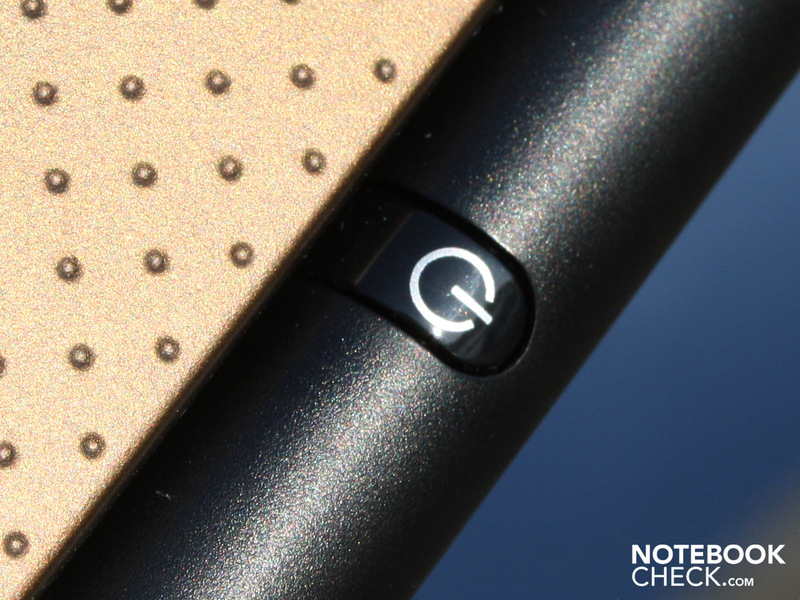 The surfaces of the pad, which is sensitive up to its edges, is blunt and offers very clear frictional resistance. 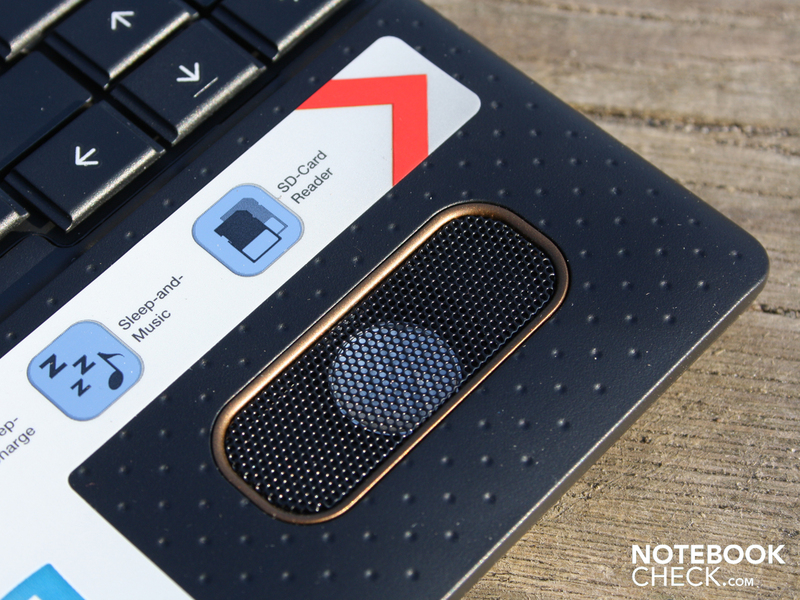 The pad's keys offer a medium hub and click quietly. 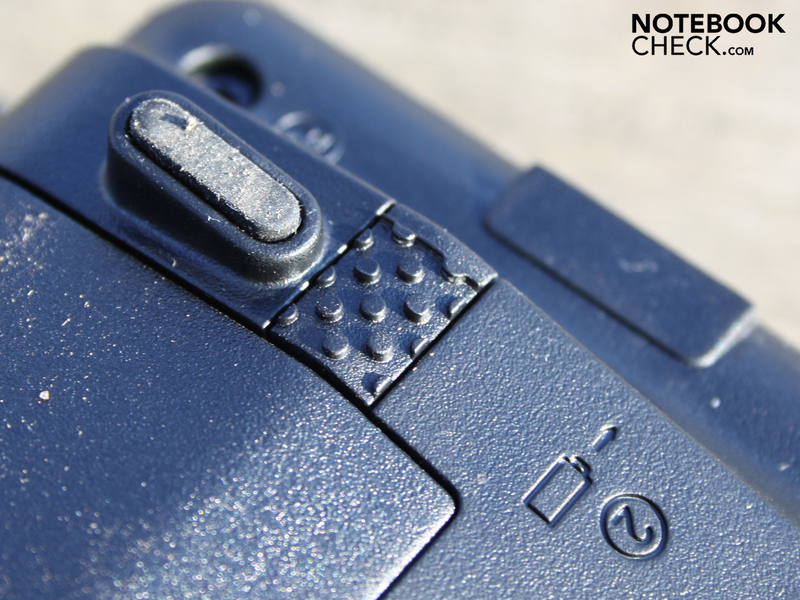 The feedback with clear pressure points is pleasant and allows for fast-paced clicking with the thumb. The 10.1" display has a relatively grainy resolution of only 1.024x600 pixels (WSVGA). HD-ready (1.366x768) would be more optimal for many users. 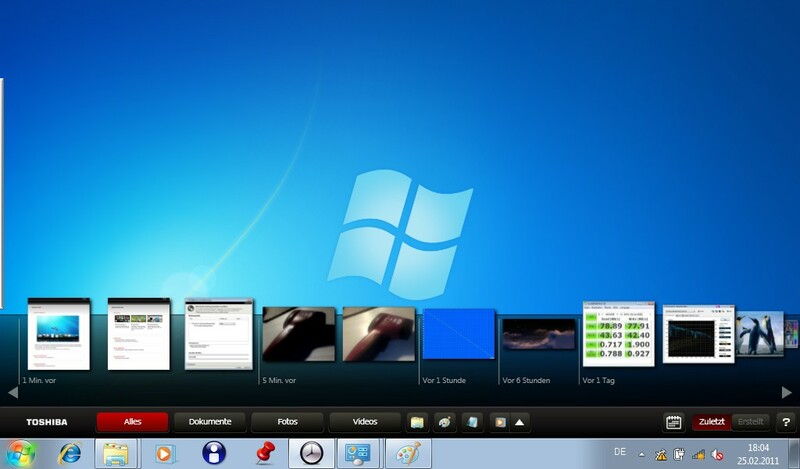 A better overview would also allow for more practical use of multiple windows. 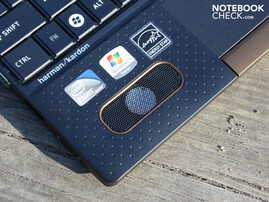 But with the NB520 one is constantly forced to scroll and switch between windows. Higher resolutions are only available on external displays via the VGA port. We connected a full-HD TFT and experienced a perfect picture with photos and 1080p trailers (even though the trailer jerked). The contrasts of the LG-panel (LP101WSA-TLN1) are poor: 160:1. Colors on the reflective TFT don't appear particularly brilliant despite it being a glare-type panel. 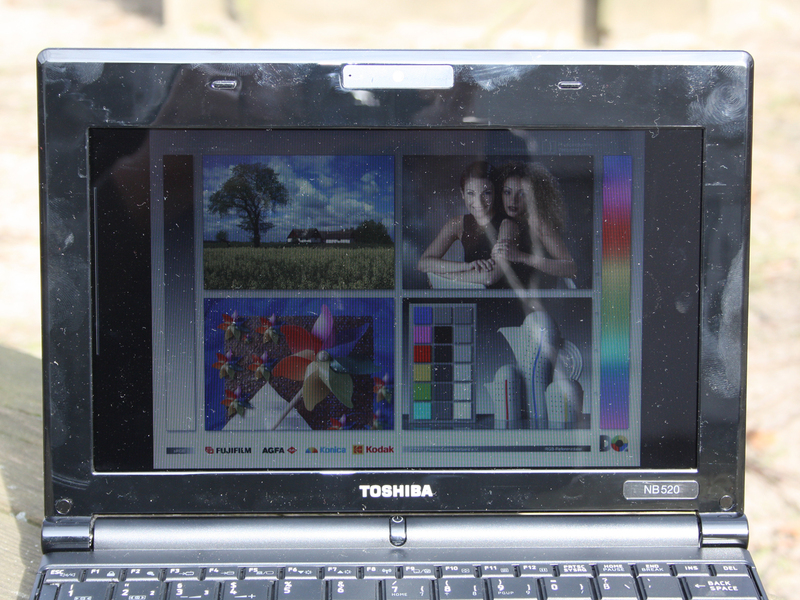 Compared to a matte display, the glare-type improves the visual impression of colors. We weren't able to measure the color space as the software of our color-meter refuses to work under WSVGA. Our average measurement of 180 cd/m² attests to a weakly-illuminated display screen. Sure, 120 cd/m² is enough for indoors, but outside the limited brightness can't stand up against the sun. Glare-type panels aren't the worst choice for impressive color impressions. But they are a catastrophe for daylight use. They reflect trees and houses as well as the user in front of it. The limited luminance of 180 cd/m² can do little to rectify these reflections. For acceptable viewing conditions the user has to seek out a shady spot or adjust the viewing angle accordingly. The painted display frame also makes a negative impression in the sun. It continues the reflectiveness of the panel and also collects dust and scratches. The horizontal viewing angles are small. Pictures can only be recognized clearly and without inverted colors up to around 40 degrees of variation from the middle. But writing can be read clearly up to 80 degrees. Vertically, writing only remains legible up to around 25 degrees due to dimming. Colors invert considerably already from 15 degrees. The frontal viewing position is therefore required for an optimal picture. 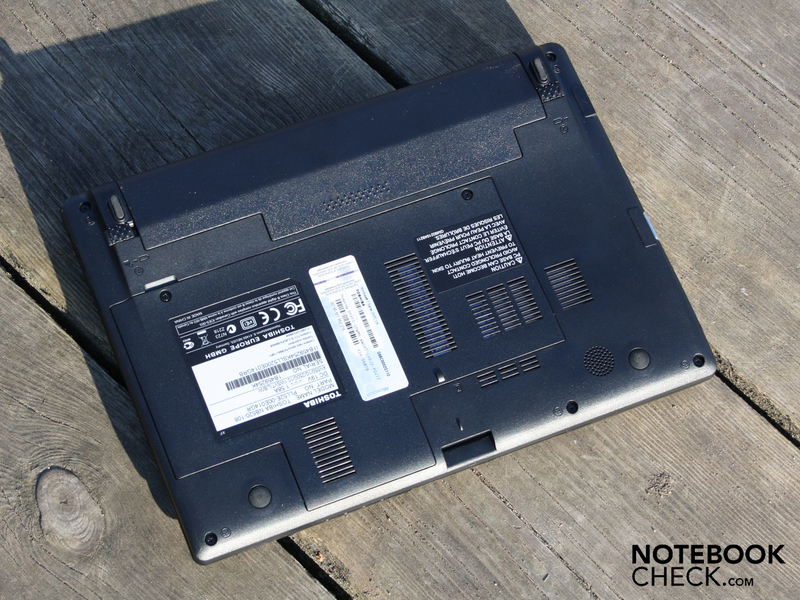 A fresh wind blew over the squad of netbooks a few months ago with the dual-core Intel Atom N550 processor (2 x 1.5 GHz, 45nm) based on the NM-chipset from Intel. With that, working with Windows 7 goes more smoothly on a netbook, though we aren't dealing with a doubling of performance. 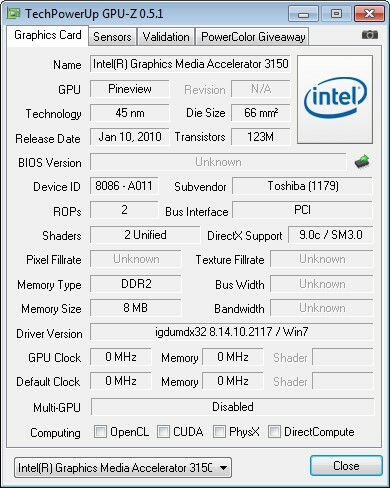 As on the single-core N450/N455, the graphics core GMA 3150 is integrated. 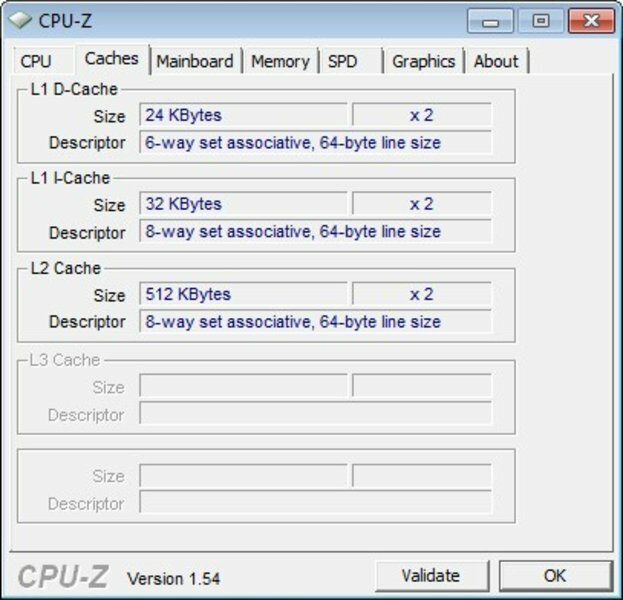 Because it also calls on Hyperthreading, the dual-core can compute a total of four threads. That accelerates above all multitasking. 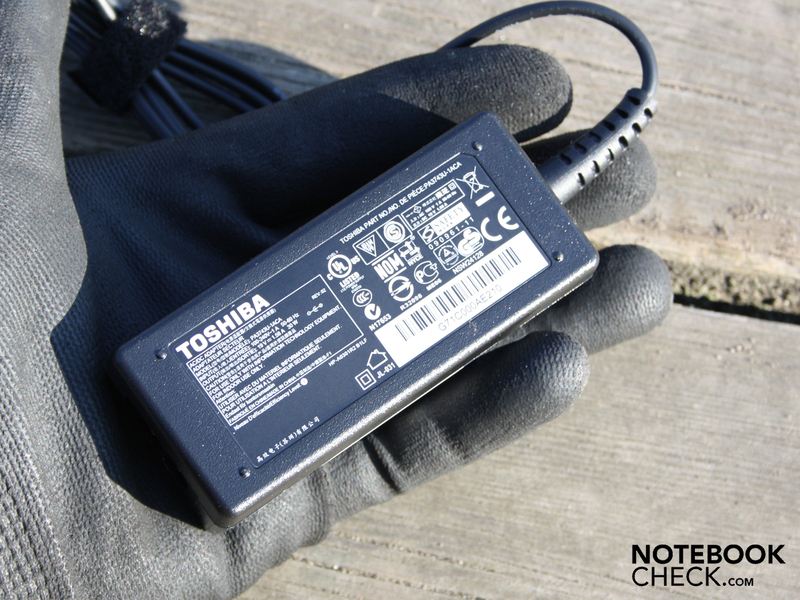 The N550 has a TDP of 8.5 watts, three watts more than the N450/N455 (5.5W). 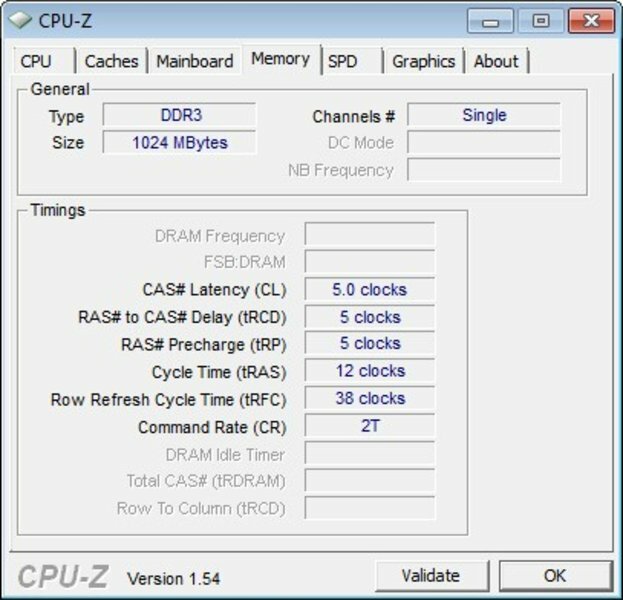 The CPU supports DDR3, of which 1 GB PC3-10600 is built in. In terms of the rest of the equipment there is a 2.5" harddrive with 250 GByte of memory (Toshiba MK2565GSXN). 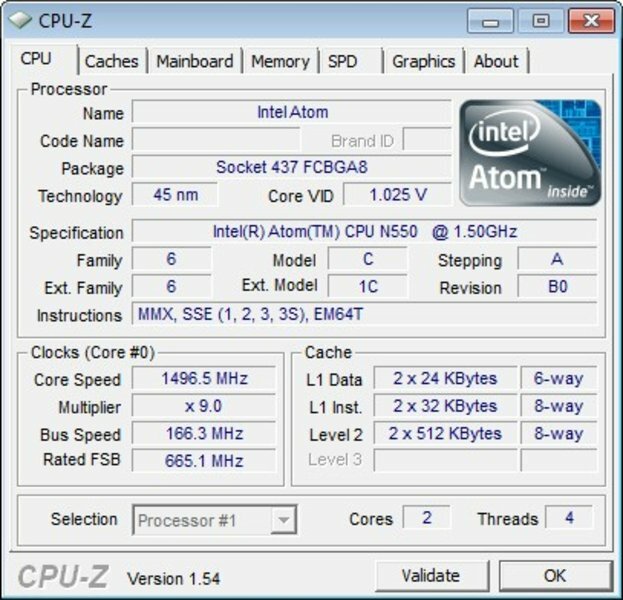 The four computing threads ensure for an improvement in multitasking operations, as is shown in a comparison with the single-core Atom N455/N450. Our N550 achieved 1,463 points in the multi-core Cinebench R10 32bit benchmark. 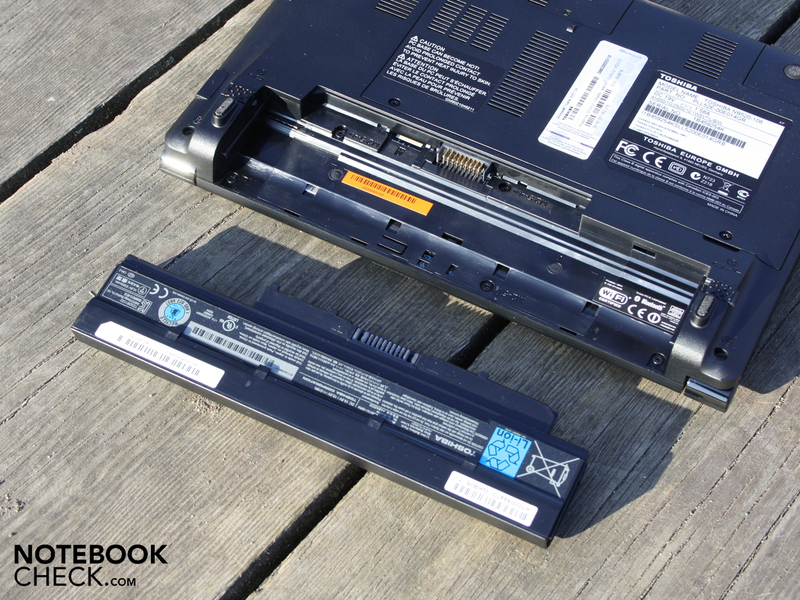 Here the N455/N450 only manage 840 (Acer One 533-13Drr) and 938 points respectively (Asus Eee PC 1008P). Not surprisingly, the single-cores are on average around 40% below par. More interesting is how the new AMD Fusion APU C-50 performs by comparison. this putters around in the sister model Toshiba NB550D. 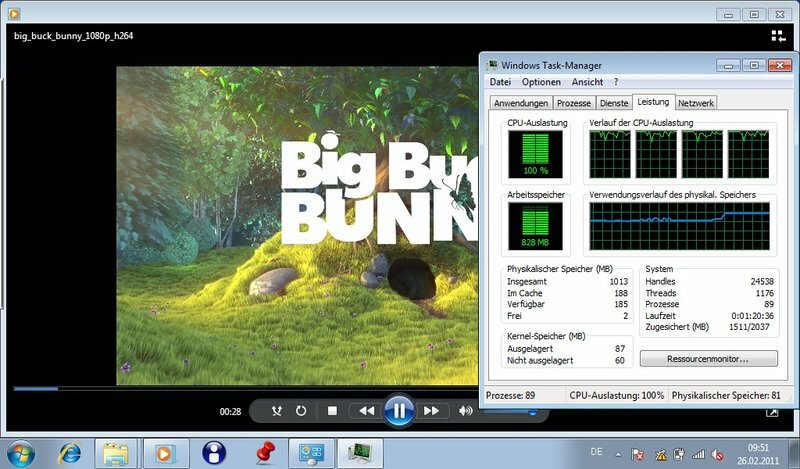 The dual-core C-50 with its 1.0 GHz is 14% slower in the Cinebench R10 Multi. 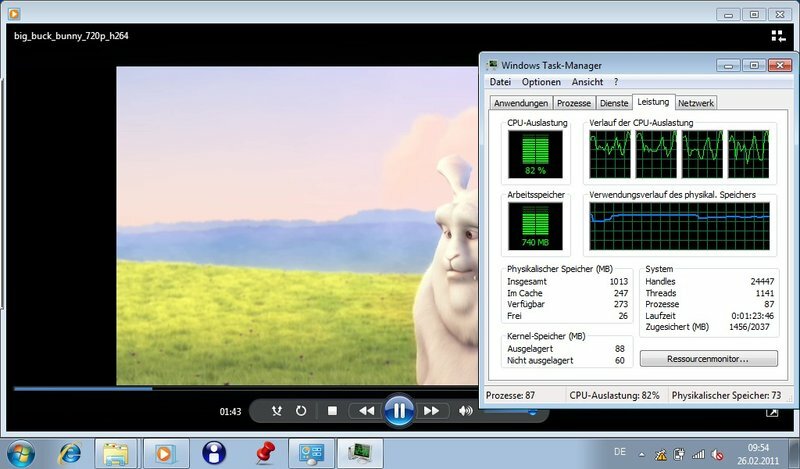 A single-core Athlon K125 (1.7 GHz, Non-Fusion, Acer Aspire One 521) is 12% slower. However, the C-50 has an edge when computing with a single thread: In the SuperPI 2M Benchmark, the C-50 computes around 20% faster, despite the low clocking. 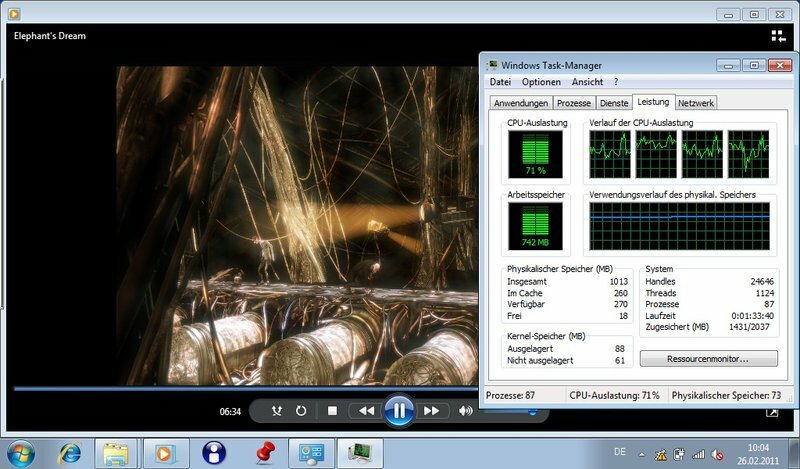 Thus the pure CPU benchmarks swing between the N550 and AMD C-50. Depending on the test, one or the other will come out on top. The system-benchmark PCMark Vantage should now show what kind of overall performance it has. 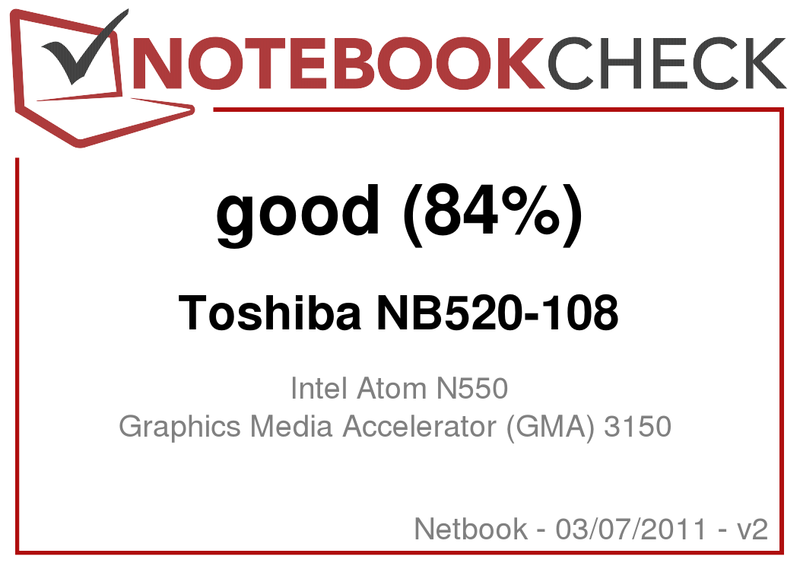 The overall score of 1,635 points is much higher than the 1,438 points of the Toshiba NB550D. 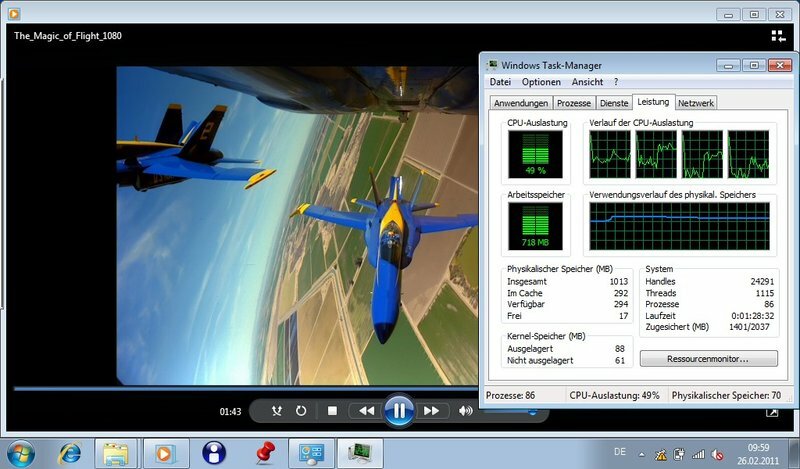 Thus our N550 system takes the lead, although the GMA 3150 graphics are much weaker than the Radeon HD 6250. The gaming-sub-score shows that: 711 versus 1,335 points. But the productivity score goes clearly in the favor of the N550 system: 1,450 versus 959 points. In the end, the full working speed is important. And this makes no difference between the Fusion- and N550 systems (without HD-video and special programs with hardware support). Both 10-inchers are rather tenacious; opening programs or changing between windows always takes a tick too long. 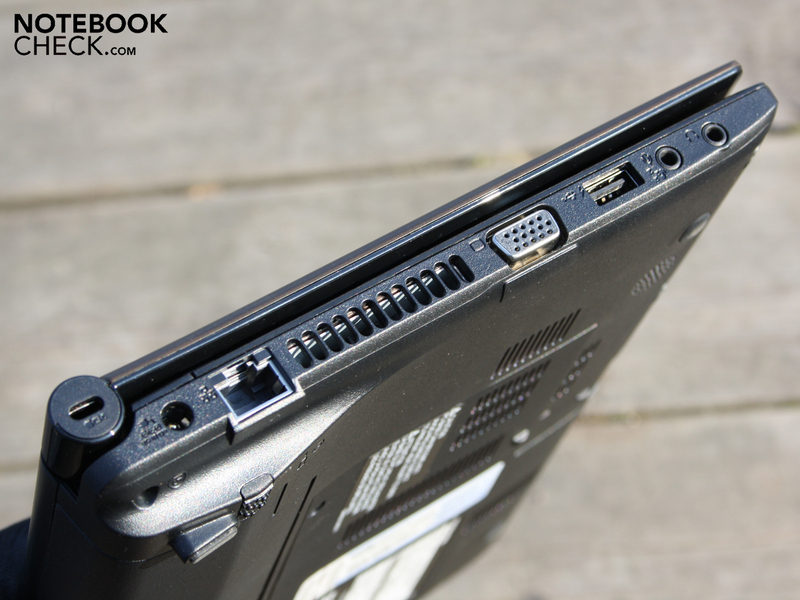 This still falls within the typical minimal performance characteristics of netbooks. 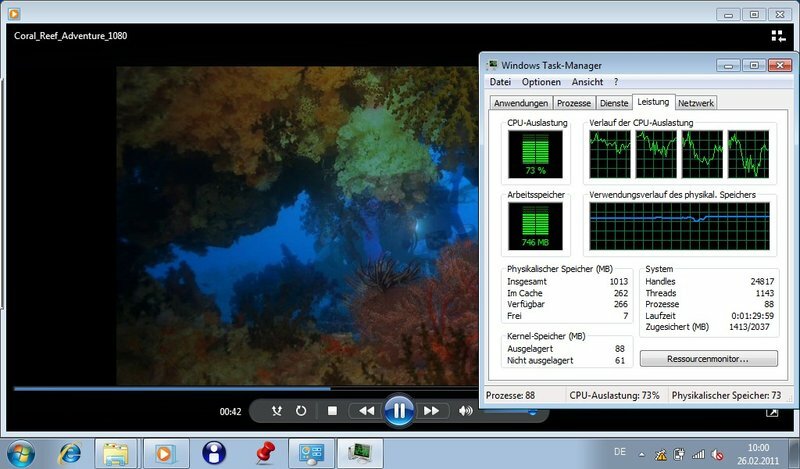 But the Radeon HD 6250 makes the difference to the benefit of the Fusion system; see under video playback in HD. 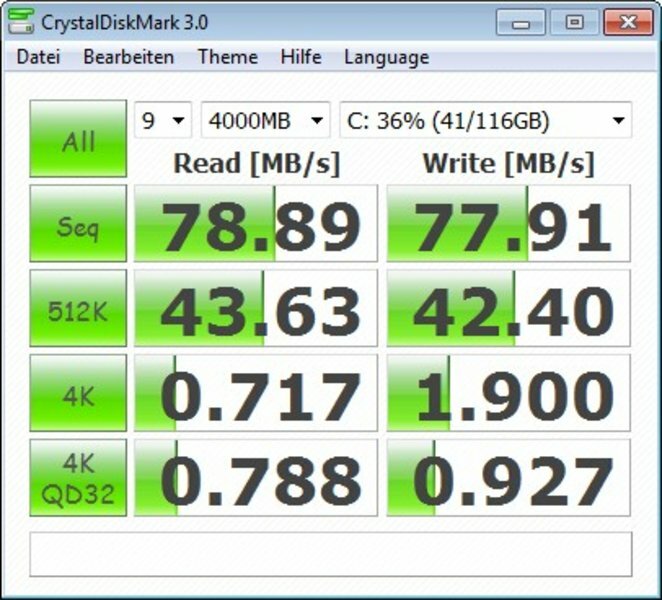 The Toshiba harddrive (Typ MK2565GSXN) with a full capacity of 250 GBytes achieves acceptable throughputs in the HD-Tune test. 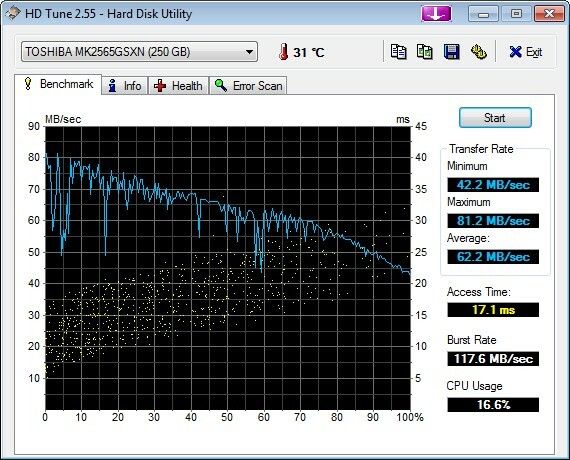 62 MB/s in the Sequential-Read-Test put it on the average level of current 2.5" notebook harddrives. The user doesn't generally have to do without perfectly high-resolving 1080p videos. But the processor load is constantly rising a great deal so that mobile operation quickly causes a state of load which taxes the battery life and leaves the fan constantly rumbling. Furthermore, the application speed is so rubbery that no other tasks can be taken care of. The picture for instance forms only with some jerking when we switch between the Media Player to the browser or into the energy control mode. The following screens show six playback-scenarios with 1080p or 720p material. In every case the load was over 50%, which already delivers a shaky picture. It depends entirely on the coding of the film, the 1080p-trailer from Elephant's Dream ran fluidly at 65-95%, while Coral Reed Adventure and The Magic of Flight with generally less load remained stuck in picture frames. If HD-video is an argument in your buying decision, than your are better off forking out a few Euros more for the sister NB550D with AMD-Fusion and a suitable video decoder. The Radeon HD 6250 graphics unit ensures that the CPU is unburdened a great deal and there is also an HDMI-connection (instead of VGA). The fan of the NB520 becomes a constant companion. It only rarely switches off at idle which results in us getting a minimal value of 32.8 dB(A) with the active fan. This noise is constant and therefore not bothersome. The harddrive is quieter than this base level of the fan. Office tasks, videos or music are accompanied by the fan with up to 35.1 dB(A). This level is obvious, but wouldn't yet be bothersome if it were constant. Instead it takes the temperature control quite precisely and apparently regulates the rpm immediately based on every change in temperature caused by short loads on the CPU. Because of that, the fan becomes constantly quieter and louder depending of whether one is copying data or just scrolling in the document. Under a heavy load (stresstest), the level rises up to 41.3 dB(A), whereby there are no longer any fluctuations. But this volume wouldn't be reached in normal use, it could only be provoked by running the Prime95 (CPU) and 3DMark2006 simultaneously. 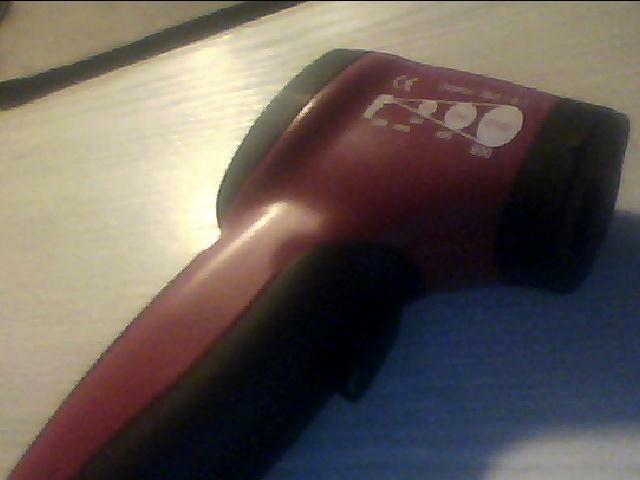 The measurements with the infrared thermometer show an unusual picture, as the temperatures at idle and under load appear to be completely identical. That means that the erratic fan manages to hold the temperatures in every operating condition to the same, cool level. This affirms the readout of the temperature sensor on the CPU: Minimum (63 degrees) and maximum (67 degrees) correspond closely to one another. (+) The average temperature for the upper side under maximal load is 24.4 °C / 76 F, compared to the average of 29.8 °C / 86 F for the devices in the class Netbook. (+) The maximum temperature on the upper side is 27.6 °C / 82 F, compared to the average of 33 °C / 91 F, ranging from 21.6 to 53.2 °C for the class Netbook. 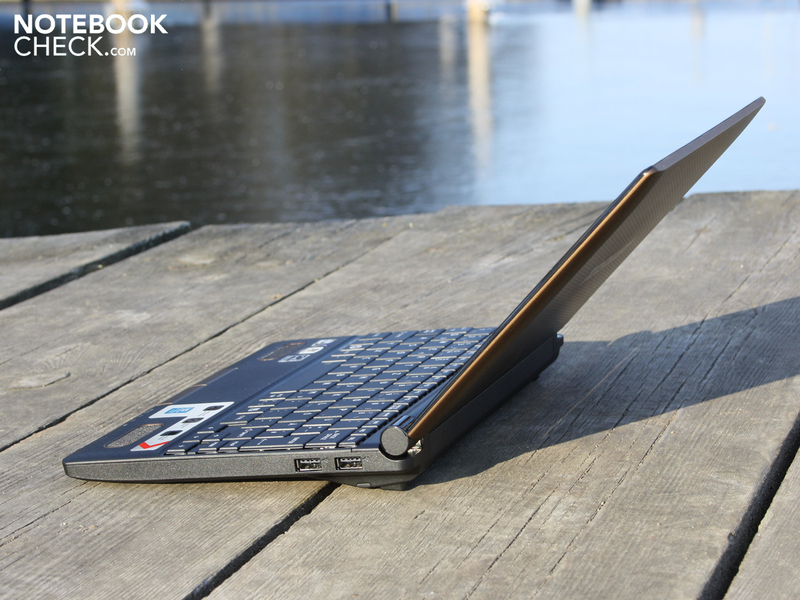 (+) The average temperature of the palmrest area of similar devices was 29.3 °C / 84.7 F (+2.2 °C / 3.9 F). The manufacturer speaks of Bass Enhanced Sound-System with Dolby Advanced Audio and built in a pair of Harman/Kardon speakers directly in the palm rest. Concerns that the hands would negatively effect the sound are only confirmed when the speakers are intentionally and completely covered. The speakers each offer a performance of 2 watts, which, in contrast to the otherwise typical 0.5 watt (or even less) models, ensures for a remarkable volume in a clear body of sound. The small subwoofers on the underside strengthen the deeps, but we can't really speak of a fat bass. The picture of sound is differentiated and relatively balanced thanks to the new deeps introduced. But the small membranes aren't feeling their best at maximum volume, which itself is indeed impressive considering the tiny size of the 10-incher. Though it doesn't produce any clinking or scratching, the pitch does become less clear. It helps here to tone down the volume a tick or two. Toshiba advertises the Sleep-and-Music function of the microphone inlet. Via a jack-to-jack cable, one can for instance control the volume of a MP3-player when the netbook is turned off. The built-in amplifier uses battery power, and creates small active boxes. 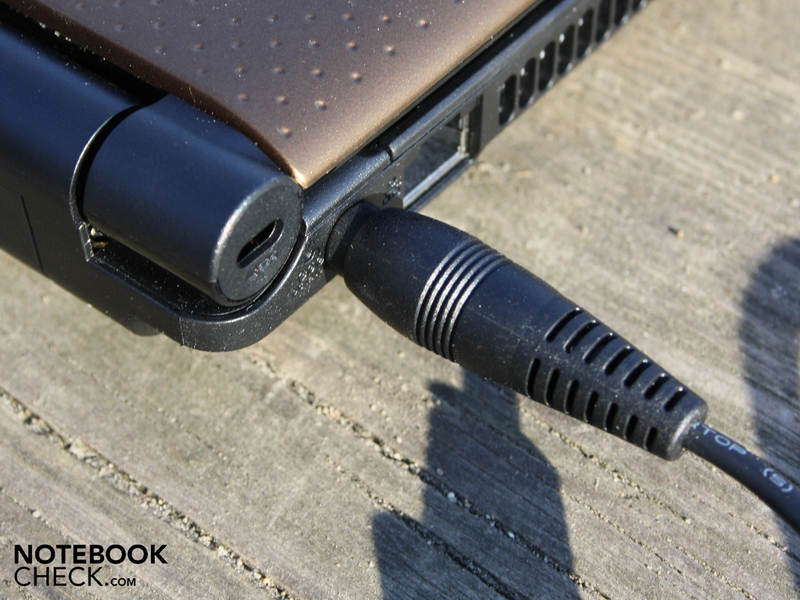 External speakers or a home-theater system can be hooked up via the 3.5mm stereo jack outlet. The NB520 doesn't have the luxury of the sound output per HMI audio signal, like the Fusion siter model NB550D. 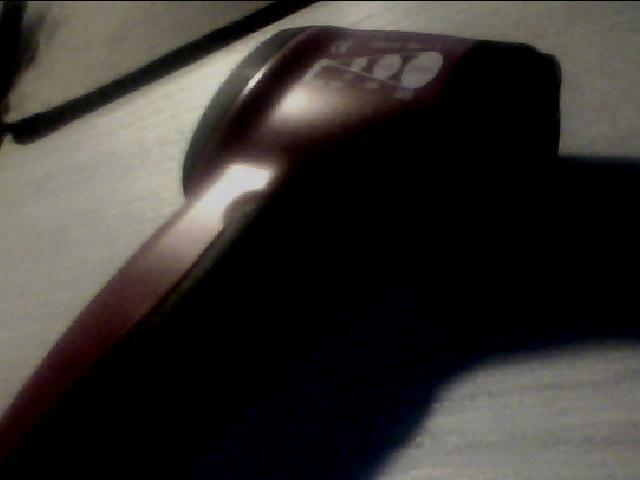 The stereo-speakers are found in the palm rest. A mini-subwoofer ensures for decent bass. 11:30 hours sound like a gigantic battery life. But the NB520 only achieved these 693 minutes at idle with the lowest brightness and WLAN deactivated. 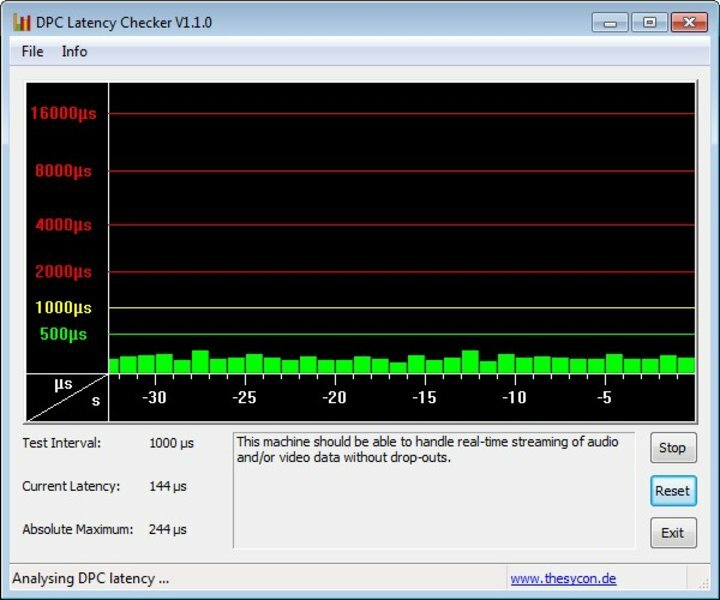 More relevant in practice is the WLAN test with its very good 7:00 hours. 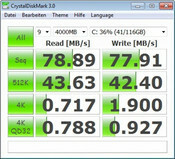 But that is less than the Fusion-variant NB550D achieved (8:43 hours). But the latter also has a somewhat stronger 63 watt hour battery at its disposal. Our N550 tester had to make do with a 57 Wh battery (5,300 mAh). There's also great pleasure in playing films from the harddrive (not H.264). Here the NB205 holds up for 6:27 hours. The brightness of the TFT wars set at around 100 cd/m² and the radio modules were deactivated. Under heaviest load (BatteryEater Classic Mode), the runtime sinks to 5:17 hours. The radio modules were active during this and the brightness was set to maximum. 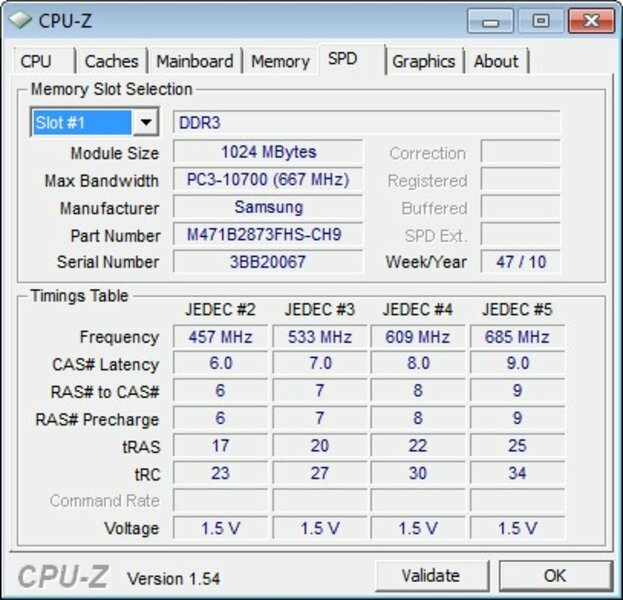 The dual-core AMD Fusion C-50 turned out the lights already after 4:19 hours. Unfortunately the charging time corresponds to the runtimes and is quite long: With the NB520 turned on, it needed a whole 4:30 hours. As a rule, strong runtimes tend to go along with a low level of current consumption from the outlet. This applies to the NB520. The multimeter measured only 6.4 watts at idle. For this WLAN was deactivated and the luminance was set to its lowest level. Those who run the 10-incher in its highest-performance mode with full brightness will get an acceptable 8 watts. 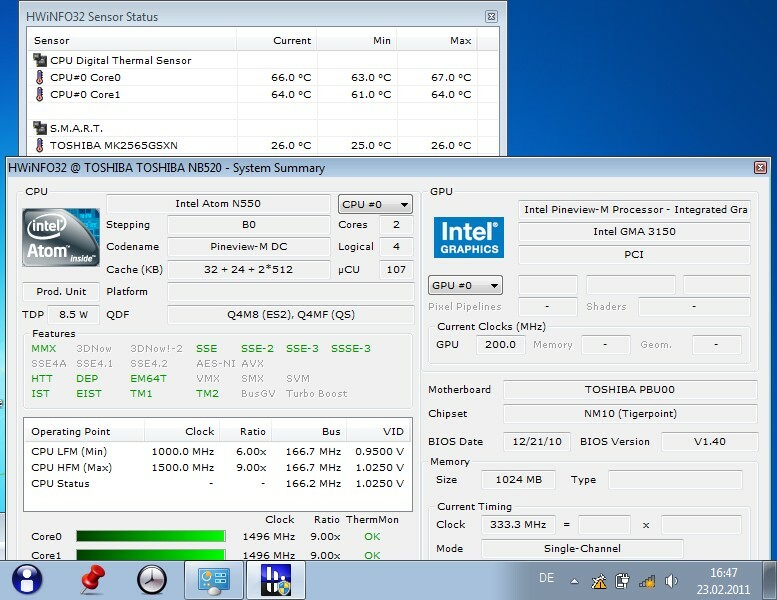 The sister NB550D shows very similar consumption values at idle: 5.4 to 6.7 watts (idle min-max.). The tiny power-pack plug is standardized for 30 watts. This is enough for the maximum energy use of 31.3 watts including charging of the battery. 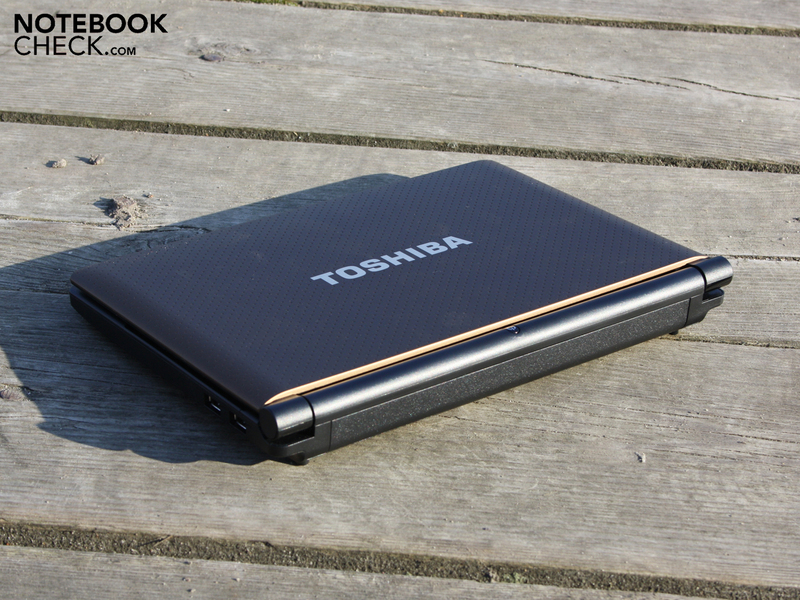 Starting at 329 Eu ros, the Toshiba NB520-108 brings a nearly all-round netbook package to the market. 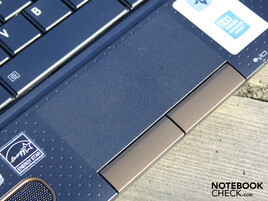 The performance is slightly improved over the single-core netbooks (N450/N455). Work now runs more smoothly at hand, although the adjective 'fast' can't really be used here. 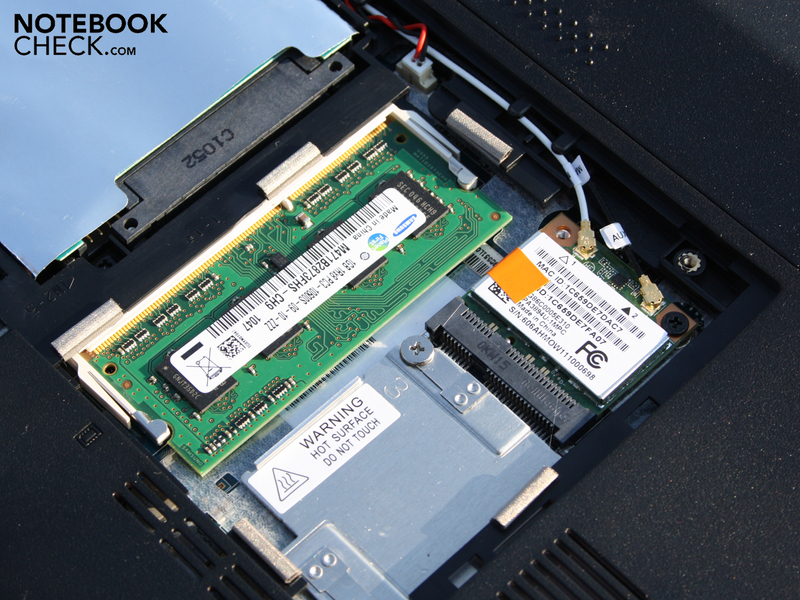 The Atom N550 system is faster when measuring system performance than the sister model NB550D with AMD Fusion APU. 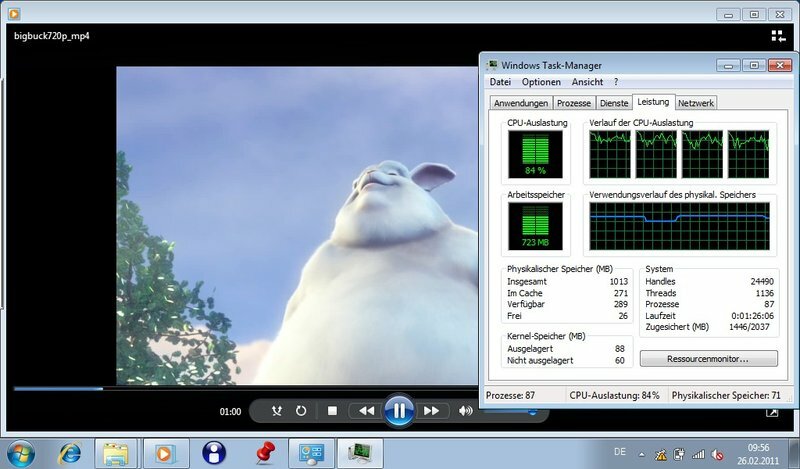 But our tester lagged behind its AMD-sister when dealing with HD-videos and unloading of the processor. Without a suitable video decoder, 720p or 1080p material burdens the processor so much than other tasks are unthinkable. But the statement, that HD-videos can't be run without jerking, could only be affirmed in part of the test videos. At seven hours (WLAN test), there's no need to hide its battery life performance. The concern that a dual-core Atom would throttle the runtimes did not turn out to be the case. Also successful are the feel and construction of the chassis, hinges and input devices. The mobility aspect is detracted from primarily by the display which has a reflective surface, is weak in contrasts and ultimately too dark (for outdoor use). Precisely because the sister NB550D is the better video entertainer, our test model should have gotten a brighter and matte display. The acoustics of the 2.1 system with mini-subwoofers and Harman/Kardon speakers (2x2 watts) is outstanding in the netbook milieu. 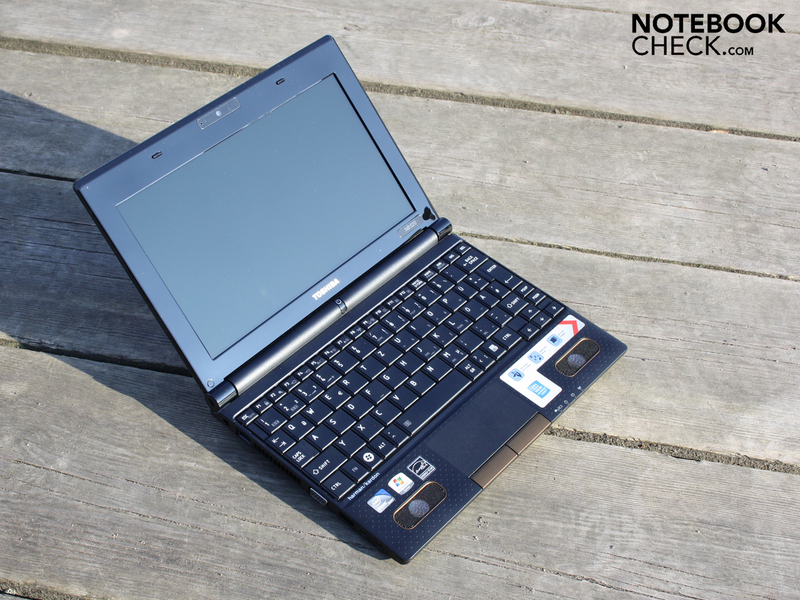 Those searching for the ultimate netbook-entertainer should be dealing with the Asus Lamborghini VX6 (Nvidia Ion 2, Atom D525), the Eee PC 1015PN (Nvidia Ion 2, Atom N550), the Aspire One 521 (AMD K125, HD 4250) and of course the Toshiba NB550D-10H (AMD Fusion APU, HD 6250). 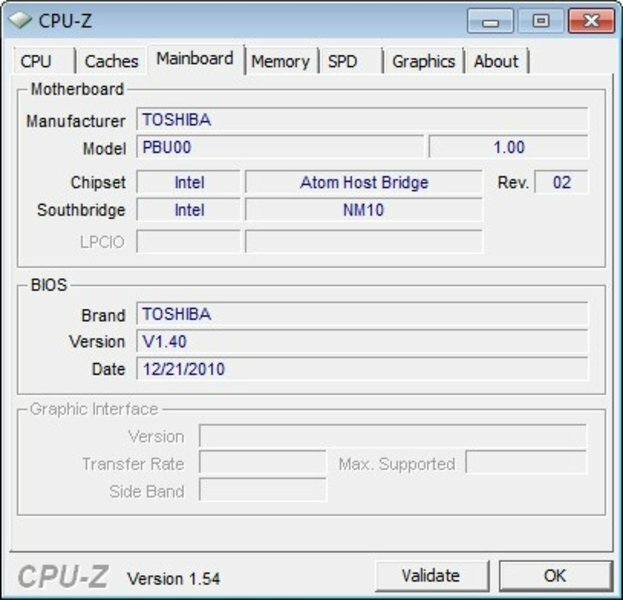 AMD Fusion is also employed in the Asus Eee PC 1015B as well as in the Acer Aspire One 522. 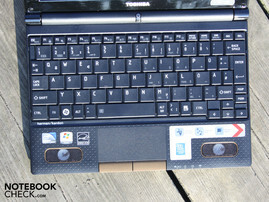 Toshiba NB520-108 brown: Good sound but as usual week netbook performance. and a DDR3-RAM slot next to the mini PCI WLAN module. 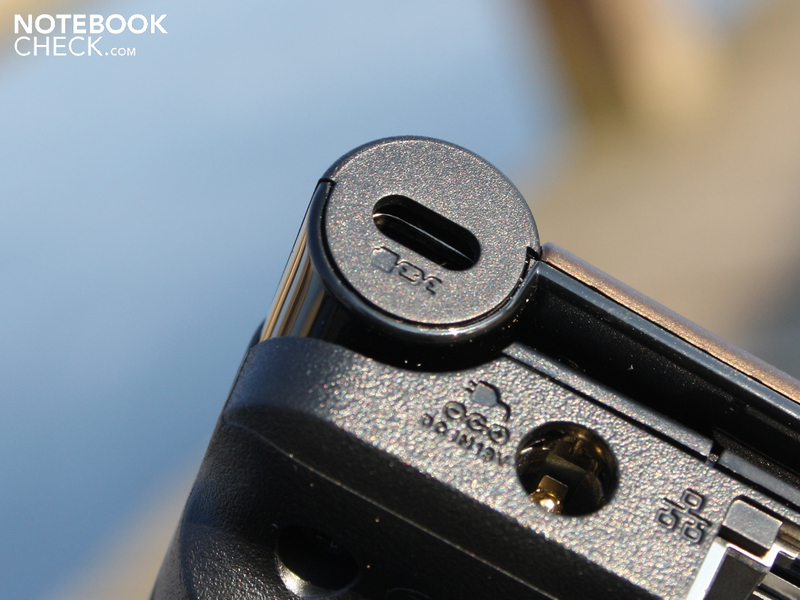 The battery can be pulled out after unlocking two such levers. The capacity of 57 Wh (5,300 mAh) is quite high. It holds the 10.1-incher on its feet for six hours (WLAN-test). 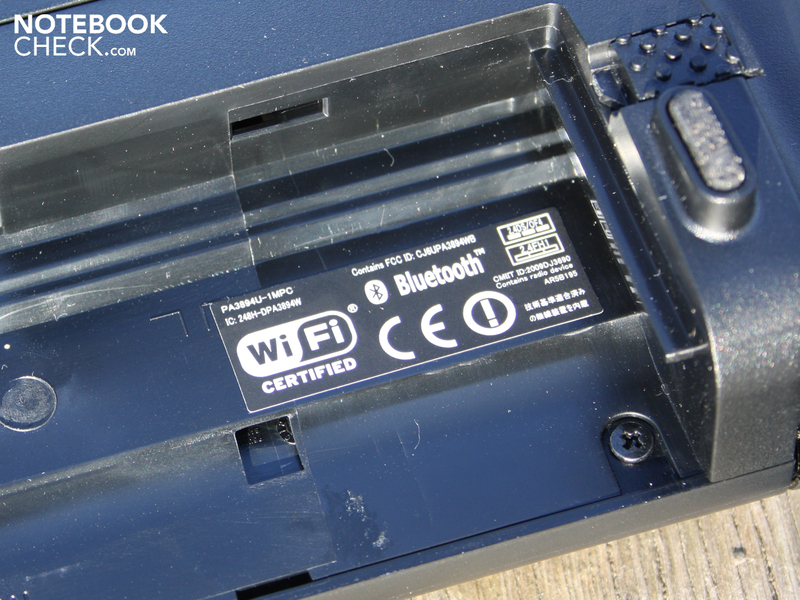 A Bluetooth module is also on board, it is part of the WLAN card. 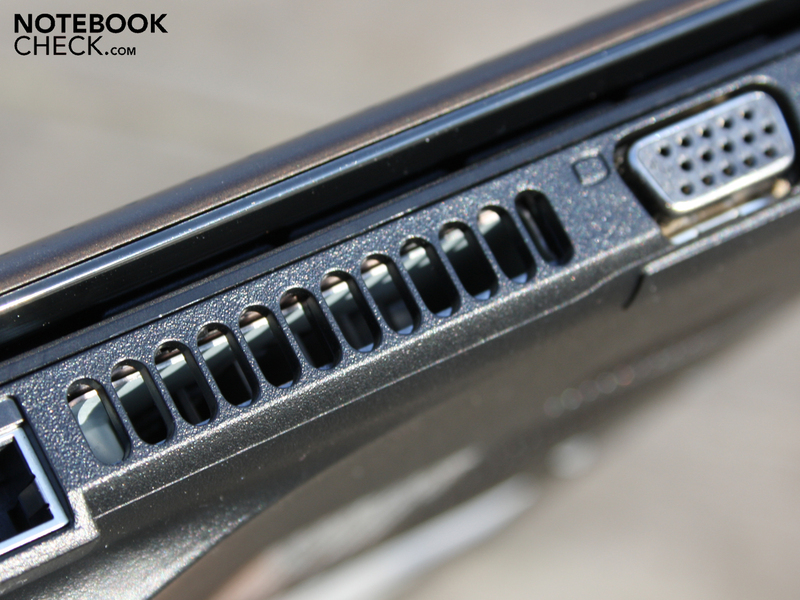 A prepared SIM card slot leads us to believe a 3G variant is upcoming. but that is still enough for the frugal current consumption at a maximum of 31.3 watts (stresstest + charging). The plug has a candle shape. 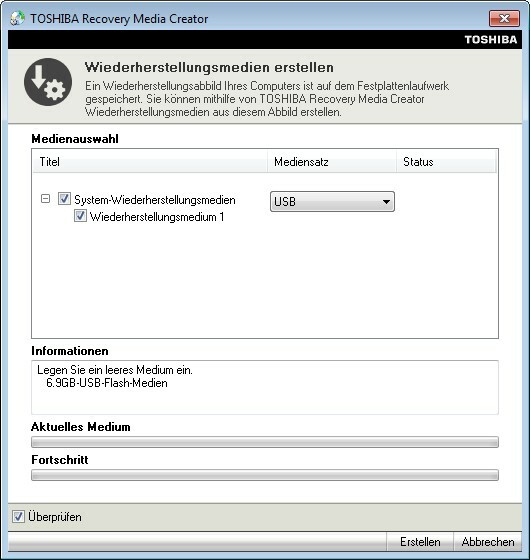 Recovery medium is not included, only a short guide and guarantee card. The flap on the underside leads to the changeable components. the manufacturer now puts all its bets on the dual-core card. The NB520-108 (here the brown variant) is equipped with an Intel Atom N550 (2x1.50GHz). The sister model NB550D-10H in the same look is adorned with AMD-Fusion: C-50 APU plus Radeon HD 6250.
with matte and patterned surfaces (part of the lid and the power button). as well as an striking and angular form (Kensington-lock). while a large area lies fallow. The left side bundles the rest of the connections, but there also aren't any special features here. The chassis is quite stiff and can only be bent with some force. 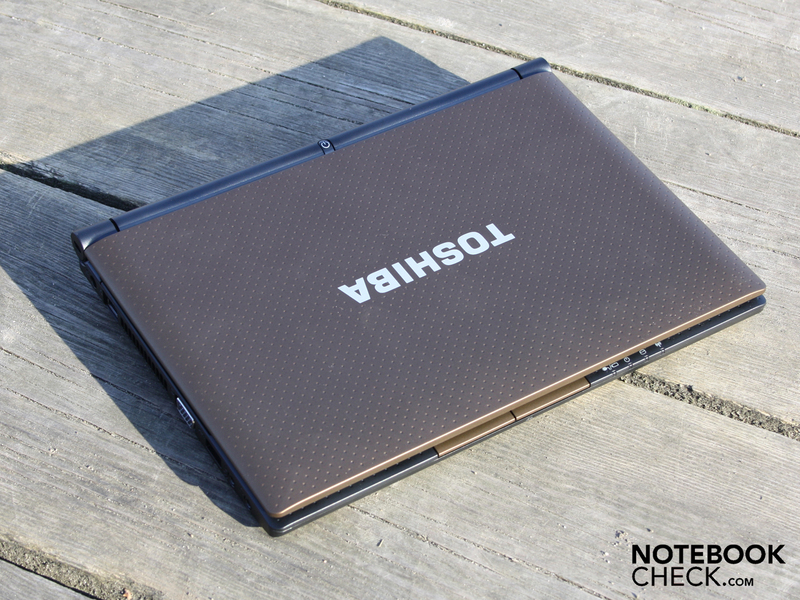 Toshiba NB520-108 brown: With the best netbook sound experience we've heard in a long time. A sweet blanket of sound projects from the small netbook. Some multimedia-noetbooks would be jealous. As a non-HD variant, it should have gotten a matte and bright TFT. Why does Samsung manage to keep perfect control of its netbook fan while Toshiba on the other hand does not?